Well, we finally are getting some big, fresh, ripe tomatoes on our plants! I'll be making lots of tomato-based recipes for awhile. If any of you have good recipes, let me know! Since our kitchen is semi-put-back-together, I attempted to cook a real dinner tonight. 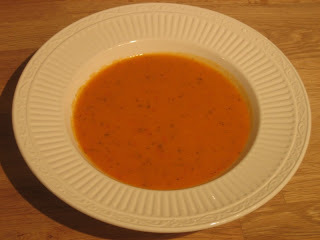 I made fresh tomato soup and boy was it good. I don't like to brag, but I do think it is as good as (or maybe better?) than the Cream of Tomato Soup at Firestone in Buellton. Their tomato soup (and most everything on their menu) is fantastic. We have so many tomatoes that I'm thinking of making up batches of the soup (without the milk) and freezing it for later. Below you'll find my recipe in case you want to try it out. This recipe was inspired by one I found on a blog last year when I was trying to use up the rest of my home-grown tomatoes. I use homegrown tomatoes which are so much better than store-bought, but you can probably get some good ones at the store or farmer's market at this time of year. Or, if you live locally, give us a call and you can have some of ours - seriously, we have eight plants! 1) Melt the butter in a large saucepan and gently cook the onion and potato until it is soft without being colored. 2) Add the tomatoes, chicken stock, basil, thyme, garlic powder, salt and pepper. Simmer 15 minutes, stirring occasionally. 3) Cool slightly and then puree in a blender. Transfer soup back to pot. 4) Reheat and add the milk or half & half. Mix well and check seasonings. If the mixture is too thick for your taste, add a little water or chicken broth.